Make your dreams of energy self-sufficiency come true! Whether you are looking to live off-grid or sell power back to the utility with a grid-tie system this is the best time to go forward using renewable energy. These systems can be used for the cottage, your main residence, or some form of RV/trailer application. Ottawa and the region immediately surrounding our Nation’s capital is one of the top places in ontario for receiving sunlight (measured in sun hours). To increase ground mount system efficiency, sun trackers, such as Deger, can be added with may increase energy capture by up to 30%. These solar trackers are based on a ground mount installation. A roof mount installation is also great for anyone looking to maximize their roof space. Recent improvements to specialized flashing (Quick Mount PV) have reduced risks for leakage in roof mount systems on asphalt shingled roofs. Not only are solar panels selling at the lowest prices ever, Ontario has come out with a fantastic incentive, the MicroFIT program. FIT stands for Feed-in Tariff. If you live in Ontario, and have a good southern exposure then you can profit from a MicroFIT solar photovoltaic (PV) electric system. And for those who live in Quebec, there is the Net metering incentive that allows you to gain a credit for all the power you generate and provide back to the grid. The technology behind the high-end commercially available solar modules, inverters, charge controllers, and batteries has remained stable for more than 10 years now. Panel efficiencies run between 14 and 18 percent. This has positive attributes such as decreasing manufacturing costs and not having to worry about whether or not your system will be made obsolete in the near term. 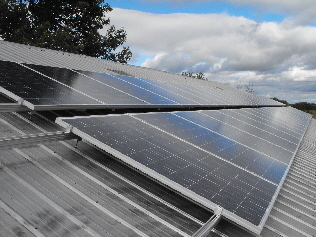 All high-end solar panels such as Sharp, Sanyo, Solarworld, Canadian Solar, Kyocera, and Evergreen have 25 year warranties and inverters + charge controllers such as Outback, Xantrex, Sunny Boy, Fronius, Morningstar, and Enphase have at least 10 year warranties. Batteries such as Surrette, carry a pro-rated 10 year warranty. Solar energy is a great source of green power. Not only is it renewable it is also readily available during the peak energy demand periods of the day and season. Complementing solar energy is wind power. Wind has the added benefit of being available all day long and is strongest during the winter months. Residential wind turbines are relatively quiet and have a sleek appearance.